Not to be confused with the Italian navy cruiser named in his honour, the Raimondo Montecuccoli. For other people named Montecuccoli, Montecuccoli. Raimondo, Count of Montecúccoli or Montecucculi (German: Raimondo Graf Montecúccoli) (21 February 1609 – 16 October 1680) was an Italian military commander who also served as general for the Habsburg Monarchy, and was also a prince of the Holy Roman Empire and Neapolitan Duke of Melfi. 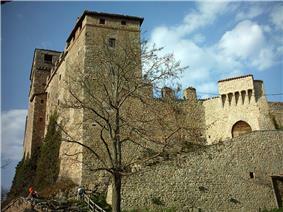 Montecuccoli was born on 21 February 1609 in the Castello di Montecuccolo in Pavullo nel Frignano, near Modena. At the age of sixteen Montecuccoli began as a private soldier under his uncle, Count Ernest Montecuccoli (died 1633), a distinguished Austrian general. Four years later, after much active service in Germany and the Low Countries, he became a captain of infantry. He was severely wounded at the storming of New Brandenburg, and again in the same year (1631) at the first battle of Breitenfeld, where he fell into the hands of the Swedes. He was again wounded at Lützen in 1632, and on his recovery was made a major in his uncle's regiment. Shortly afterwards he became a lieutenant-colonel of cavalry. He did good service at the first battle of Nordlingen (1634), and at the storming of Kaiserslautern in the following year won his colonelcy by a feat of arms of unusual brilliance, a charge through the breach at the head of his heavy cavalry. He fought in Pomerania, Bohemia and Saxony (surprise of Wolmirstadt, battles of Wittstock and Chemnitz), and in 1639 he was taken prisoner at Melnik and detained for two and a half years in Stettin and Weimar. In captivity he studied military science, and also geometry by the way of Euclid, history of Tacitus, and Vitruvius' architecture, all the while planning his great work on war. Returning to Italy and to the field in 1642, Montecuccoli commanded mercenaries loyal to the Duke of his native Modena during the First War of Castro, but when that conflict ground to an unproductive stalemate he departed. His involvement, though understandable given his allegiance to Modena, was nonetheless unusual in that his service pitted him against the papal forces of Pope Urban VIII. In 1643 he was promoted to lieutenant-field-marshal and obtained a seat in the Prince Rákóczy of Transylvania, on the Danube and Neckar against the French, and in Silesia and Bohemia against the Swedes. The victory of Triebel in Silesia won him the rank of General of Cavalry, and at the battle of Zusmarshausen in 1648 his stubborn rearguard fighting rescued the imperialists from annihilation. For some years after the Peace of Westphalia Montecuccoli was chiefly concerned with the business of the council of war, though he went to Flanders and England as the representative of the emperor, and to Sweden as the envoy of the pope to Queen Christina, and at Modena his lance was victorious in a great tourney. In 1657, soon after his marriage with Countess Margarethe de Dietrichstein, he was ordered by the Emperor to take part in the Habsburg expedition (as agreed between the King of Poland and the Emperor) against Prince Rákóczy, Charles X Gustav of Sweden and the Cossacks, who had already, in 1655, attacked the Kingdom of Poland in the war known in Poland as The Deluge or elsewhere as the Second Northern War. During the conflict he was promoted to commanding officer of the division. He became field-marshal in the imperial army and his division, along with Stefan Czarniecki's division, Frederick William's army and Danish forces, participated in the struggle in Denmark against the invading Swedes. Eventually the war ended with the Peace of Oliva in 1660 and Montecuccoli returned to his sovereign. From 1661 to 1664 Montecuccoli, with inferior numbers, defended Austria against the Turks but at St. Gotthard Abbey, on the Rába, he and Carl I. Ferdinand Count of Montenari defeated the Turks so comprehensively that they entered into a twenty-year truce. They were given the Order of the Golden Fleece, and Montecuccoli became president of the council of war and director of artillery. He also devoted much time to compiling his various works on military history and science. He opposed the progress of the French arms under Louis XIV, and when the inevitable war broke out he received command of the imperial forces. In the campaign of 1673 he completely outmanoeuvred his rival Turenne on the Neckar and the Rhine, captured Bonn and joined his army with that of the prince of Orange on the lower Rhine. 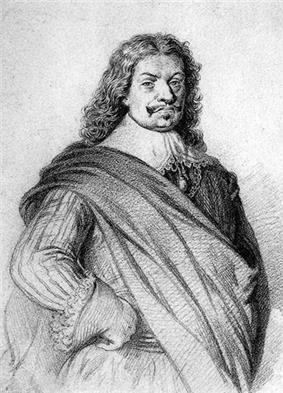 He retired from the army when, in 1674, the Great Elector was named command in chief, but the brilliant successes of Turenne in the winter of 1674 and 1675 brought him back. For months the two famous commanders manoeuvred against each other in the Rhine valley, but on the eve of a decisive battle Turenne was killed and Montecuccoli promptly invaded Alsace, where he engaged in another war of manoeuvre with the Great Condé. The siege of Philippsburg was Montecuccoli's last achievement in war. The rest of Montecuccoli's life was spent in military administration and literary and scientific work at Vienna. In 1679 the emperor made him a prince of the empire, and shortly afterwards he received the dukedom of Melfi from the King of Spain. Montecuccoli died in an accident at Linz in October 1680. As a general, Montecuccoli shared with Turenne and Condé the first place among European soldiers of his time. For his success in halting the Turkish advance he had been hailed the savior of Europe. He was also influential as a military theorist, with perhaps his most famous quote being "For war you need three things: 1. Money. 2. Money. 3. Money." His Memorie della guerra profoundly influenced the age which followed his own. "Unequalled as a master of 17th-century warfare, Montecuccoli excelled in the art of fortification and siege, march and countermarch, and cutting his enemy’s lines of communications. In advocating standing armies, he clearly foresaw future trends in the military field". In 1657, Montecuccoli married Countess Margarethe de Dietrichstein. With the death of his only son Leopold Philip Montecuccoli in 1698 the principality became extinct, but the title of count descended through his daughters to two branches, Austrian and Modenese. The Memorie della guerra was published at Venice in 1703 and at Cologne in 1704. A French edition was issued in Paris in 1712 and a Latin edition appeared in 1718 at Vienna, and the German Kriegsnachrichten des Fürsten Raymundi Montecuccoli was issued at Leipzig in 1736. Of this work there are manuscripts in various libraries, and many memoirs on military history, tactics, fortification, written in Italian, Latin and German, remain still unedited in the archives of Vienna. The collected Opere di Raimondo Montecuccoli were published at Milan (1807), Turin (1821) and Venice (1840), and include political essays and poetry. In 1934 the Italian navy launched the Raimondo Montecuccoli, a Condottieri class light cruiser named in his honour which served with the Regia Marina during World War II. ^ a b c d e f g h i j k l m n o Chisholm 1911, p. 714. ^ Black 2002, p. 162. ^ Paoletti 2008, p. 28. ^ See Chapter 6 of Book 3 , A Warriors Life (2013) , Roger Gard's translation of Servitude et grandeur militaires by Alfred de Vigny along with Gard's notes. Anonymous (2012). Raimondo Montecuccoli (Online ed.). Encyclopædia Britannica Inc.,. Black, Jeremy (2002). European Warfare, 1494-1660. Routledge. p. 162. Paoletti, Ciro (2008). A Military History of Italy. Greenwood Publishing Group. p. 28.